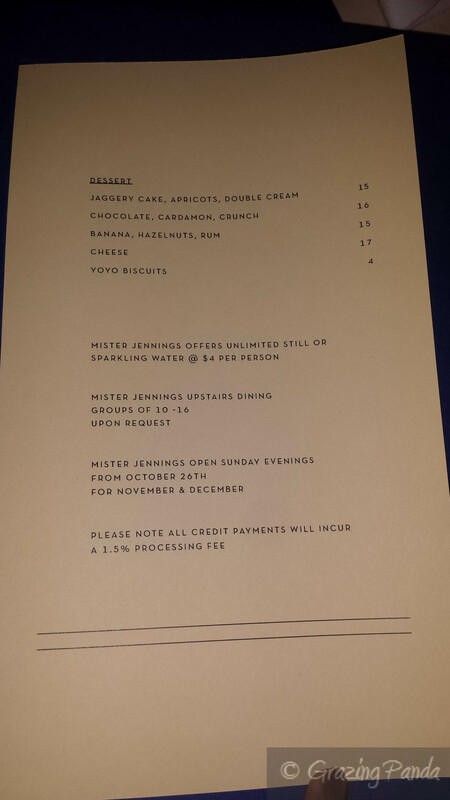 Mister Jennings is a newly opened restaurant located in Bridge Road in Richmond by owner and head chef Ryan Flaherty. Flaherty has previously worked at The Fat Duck (UK) and El Bulli (Spain), returning home to build up institution The Estelle (Northcote) before leaving last November. Fast forward to 2014 and Mister Jennings is Flaherty is his first solo project and he has enlisted the help of sous chef Jack Ingram in the kitchen, Malcolm Singh (Pei Modern) as restaurant manager and sommelier Lincoln Riley to create the spectacular wine list. Mister Jennings – named after his favourite childhood author: Paul Jennings as well as his favourite school teacher – can seat 36 guests and additionally has a private dining room that can seat 16. The venue itself has a Swedish minimalist feel to it complete with ash blonde tables together with key blue feature items on display in the form of wooden posable artists’ drawing models that cling to various places around the restaurant in cheeky positions, navy plumbing pipes, shelving and light blue plates on top of the tables. You can tell that during the day the space will be drenched with lots of natural light and would create a light and airy feeling. Two things I love – the random addition of a blue chair amongst the ash blonde chairs and the wooden bar above the main strip of seating that creates a trapeze like effect for the wooden posable models. Another feature highlight is the spectacular artwork by Mike Pelletier which features a man that looks like he has been carved out of gold. The bar is visual spectacle complete with hexagonal mirror panels set against a navy blue backdrop in a honeycomb pattern, finished with stunning looking stools that have an ash coloured wooden top with dark metal rods forming the base (which were designed by local designer Lauren Garner). The menu reads like one of experience and ingenuity- dish after dish of interesting and clever combinations, surprises and innovations. Essentially split into four sections – Starters, Entrees, Mains and Desserts – Mister Jennings wants you to be able to pick and choose what type of meal you want to have – be it drinks and snacks or a hearty meal of steak and chips. There is also the option to order the 5 course tasting menu ($80) if you want the chef to pick for you. The Starters include dishes such as Oysters (there are two varieties to choose from – Coffin Bay or Cloudy Bay), Fuet Anis (which I learnt was a type of Salami) as well as the highly popular and known dish Boudin Blanc/Dagwood Dog. 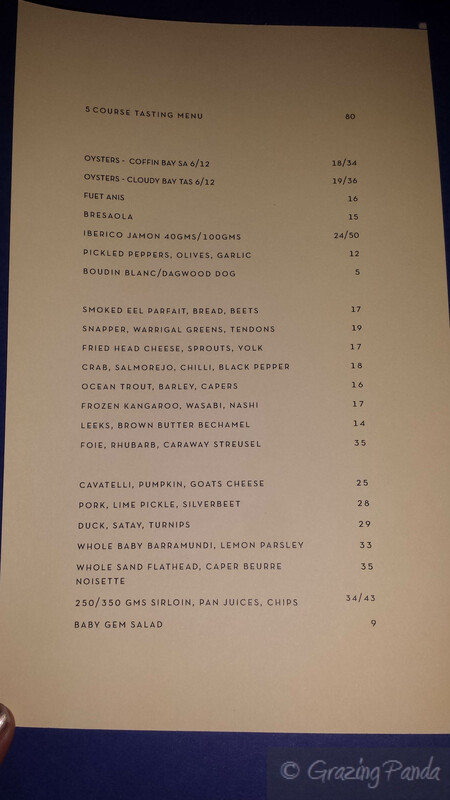 The Entrée section is where the star dish from Mister Jennings can be found – Frozen Kangaroo, Wasabi, Nashi. Other dishes include Smoked Eel Parfait, Bread & Beets, Ocean Trout, Barley & capers, Foie, Rhubarb & Caraway Streusel. The Mains include a Pasta dish, a Pork dish, a Duck dish, two selections of Fish dishes (Whole Baby Barramundi or Whole Sand Flathead) as well as two options of Sirloin (250g or 350g). Dessert presents five options including a Cheese option – all of which sound extremely enticing. We had organised one of our usual work catch-up dinners and had a booking for 8pm. Unfortunately due to a crazy busy work period going on I only arrived around 9:45pm – so I missed out on the “entrees” that the table had ordered. They had ordered the Boudin Blanc/Dagwood Dog – a battered and deep fried boudin blanc (a white sausage made of pork liver and heart meat with pork rice dressing) served with homemade tomato ketchup with smoked paprika. The Frozen Kangaroo, Wasabi, Nashi was another dish they had ordered. This dish is all about the mastery and ingeniousness – thinly sliced peppery kangaroo carpaccio is served frozen and only defrosts in the warmth of your mouth. It is served with Nashi pear, pickled onions, red wine, veal jelly together with an avocado and wasabi puree – creating hot and cold accents around your palate. My friends were left a little underwhelmed with this dish but did enjoy certain aspects of it. The Leeks, Brown Butter Bechamel dish was also ordered. The roasted leek is hidden amongst the béchamel sauce which has the extra added flavouring of brown butter and topped with olives, parmesan and breadcrumbs. V said she really enjoyed this dish and the flavour combinations. The last dish they ordered was the Snapper, Warrigal Greens, Tendons – the pan-seared snapper fillet sits at the base of the dish, amongst a soup of jus and covered with warrigal greens and finished with beef tendons that are reminiscent of a prawn cracker – as it has the same crispy coating and texture. When I arrived the waitress we had was very helpful and talked me through the menu as well as answering any questions that I had. She even gave me suggestions as to what dishes she would recommend. As I was starving I ordered both an entrée and a main – she was nice enough to get me the entrée in quick time to ensure that my main came out at the same time everyone else at the table did. Love the service! For the Entrée I ordered the Crab, Salmorejo, Chilli, Black Pepper to start. When the dish appears you can’t help but utter “oohs” and “ahhs”. There is vibrant orange colour of the Salmorejo that your eyes are immediately drawn to with a fresh green leaf placed delicately on top. Under this leafy green is the hidden mound of crab goodness. The crab was fresh mixed with celery and a mayonnaise type sauce. The Salmorejo was a brilliant mix of pepper, tomato and creaminess and together with the crab was one delicious dish. A must try. For my main I ordered the Cavatelli, Pumpkin, Goats Cheese on recommendation from our friendly waitress – and am I glad she did. I had asked her what Cavatelli was and she replied with the perfect description – “If gnocchi and a tortellini had a baby – cavatelli is what you would get” – and she was entirely correct. The flavours of this dish were simply divine – the creamy pumpkin sauce with a hint of spice coupled with the silky goats cheese and the crunchy texture of the pine nuts. The cavatelli was not entirely soft but added the perfect addition to the smoothness of the other ingredients. This was my first cavatelli experience and boy was it an enjoyable one! C ordered the Pork, Lime Pickle, Silverbeet dish. When the dish arrives you are greeted with a shroud of fresh green silverbeet and the anticipation builds up of what is underneath. Once you peek under you are greeted first by the bright orange baby carrots which sit atop of the pork. The nettle puree acts as the base together with the lime pickle. C got thru his dish in a ridiculous amount of time – clearly enjoying the dish A LOT! V ordered the Whole Baby Barramundi, Lemon Parsley and H the Whole Sand Flathead, Caper Beurre Noisette. Both dishes were simply presented – allowing the fish and their flavours to speak for themselves. The fish was placed on the plate alongside half a lemon and topped with parsley and capers respectively. They both enjoyed the freshness and simplicity of the flavours which allowed the natural fish flavours to shine. L ordered the Duck, Satay, Turnips. Once again the element of surprise was used in the plating up of this dish – with thin slices of turnip topped with peanuts, providing cover for the duck that was shielded underneath, sitting in a satay flavoured sauce. L thought this dish was average – and found that the overall flavouring of the dish somewhat masked the flavours of the duck. A few of us still had room for dessert. I ordered the Jaggery Cake, Apricots, Double Cream. The dish came out looking nothing like what I had imagined. My first thoughts was that it looked like something I would find at the beach – sea sponge with green dustings of seaweed. However once you start eating this dessert your mind will be blown –the jaggery cake is crunchy and fluffy billows of sponge made with prune sugar, topped with cream. But wait there’s more – semi dried apricots appear hidden underneath added additional sweetness and tang to the dish. A unique dessert that you definitely won’t find anywhere else. C ordered the Chocolate, Cardamon, Crunch – which was described to us “Chocolate Chocolate Chocolate” – and that is exactly what it was. The dessert is presented to you and then followed by rich chocolate sauce being drizzled out of a copper pot. There are bursts of citrus through the chocolate biscuit and creamy yet light chocolate moussed with a mix of hot and cold sensations – pure awesomeness! The staff are superb – friendly and very helpful – they make the running of a restaurant despite the crowds look easy. The menu is a mix of adventurous and simple dishes – both of which are simply done well. The look and feel of the place is cheeky whilst maintaining a welcoming and relaxed vibe. Mister Jennings is definitely a place that I would recommend to anyone looking for a great food and flavour journey – and one that I will be returning to! Service: Fantastic! Super friendly, helpful and knowledgeable as well as being relaxed, warm and welcoming.